It rained for most of the day today, so I ended up staying here another night. The bike shop in town had a 700c, 36 spoke wheel. It was a cheap brand that I never heard of, but I went ahead and got it anyway. The attractive price was hard to resist, and now I have a nice new wheel. I took some time in the shop to dismantle the old wheel, saving the spokes and Shimano Deore hub to send home and add to my collection of spare bicycle parts. 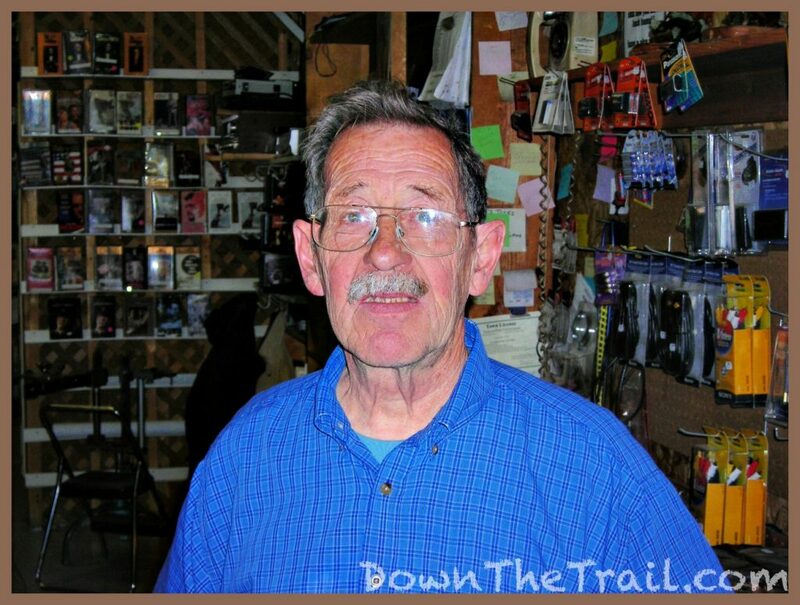 The owner, Les, opened the bike shop in 1968, and said he’ll be closing it downs soon. If it was up to his wife, he would have retired already! He also said that he’s lost a lot of business since Wal-Mart opened. “There’s a Wal-Mart around here?” I asked. He also had a whole notebook full of Bicycling magazines dating back as far as 1976, so it was cool to page through those. It seems they used to have at least two articles on touring in each and every issue, and a number of the cover photos were of cyclists on tour. 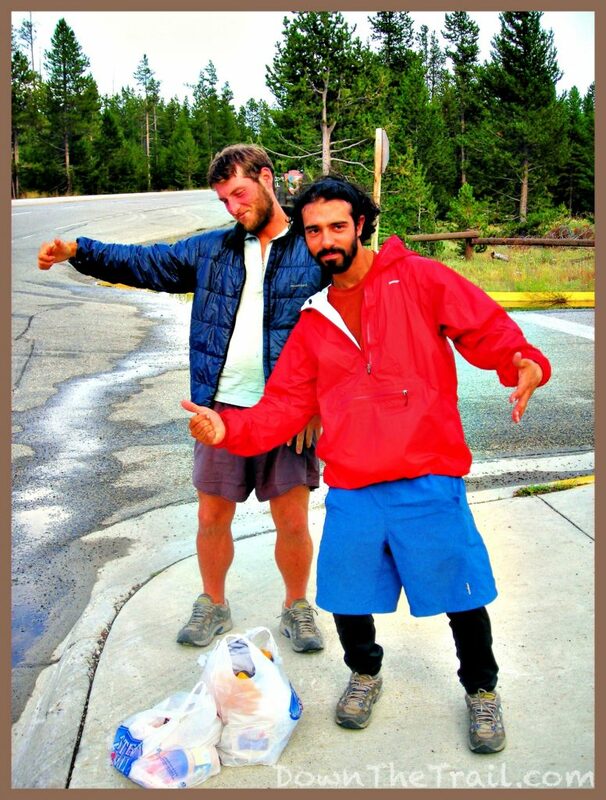 I saw two guys trying to hitchhike into Yellowstone, and I know a backpacker when I see one, so I thought I’d strike up a conversation. 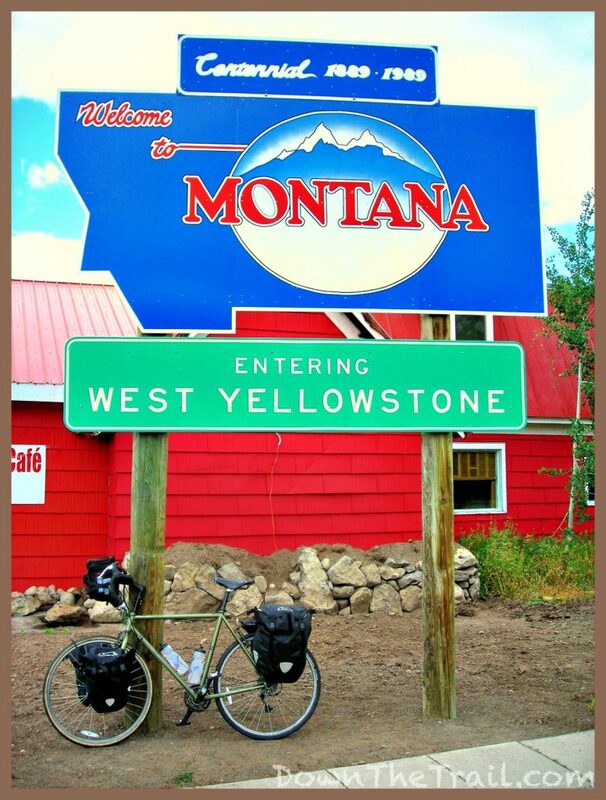 It turns out that they’re hiking the Continental Divide Trail, and like Packrat, will have soon completed all three major distance trails! Their trail names are Pepper and Nacho, and they were just in town to re-supply. Pepper hiked the AT in ’03, and Nacho hiked in it ’02 – Nacho and I knew a lot of the same people in ’02, but had never met. Pepper is from York, PA – not a long distance from my hometown. While we were standing and talking, this bison just waltzed out of the woods into town. A cop was right there, and with his car he sort of chased it back into the woods with a series of honks and sirens… business as usual around here, I guess. Another unique thing I noticed is that all the dumpsters in town are bear-proof. It’s cold here! The weather today was a nasty, chilly rain – not exactly a summer shower. I’d say the last few days’ weather is comparable to that of October, or even November in Allentown PA. Checking the weather forecast, I saw that the low temperature for the next few nights is supposed to be in the thirties. This is August! I spent most of the the day hanging out here at an internet cafe, uploading pictures. I took so many during the last few days in the parks. Is it overkill to post all of them? I skipped a few that seemed too redundant. My cell phone still says no service in town, and it’s annoying because I see other people talking on theirs. I haven’t phoned anybody since Colorado, but I’m too cheap to buy a phone card. Cingular pay-as-you-go had better work once I hit the west coast. I love getting the guestbook messages and email… please keep it up, but some of you are way too kind! Back in Lander, Jim gave me this old ten-cent paperback by Isaac Asimov, called The Currents of Space. It dates back to ’52 or ’53 – I’d have to check. I just started reading it today, and it’s a light, enjoyable read. I’m not a big science fiction reader, and have never read Asimov before, but it’s fun and I like it. Life is good.